Since discovering Rhys Bowen's cozy mystery series Her Royal Spyness, I've been trying to read all her other books. Last winter, I read my first stand-alone novel by her, The Tuscan Child (read my review) and loved it. 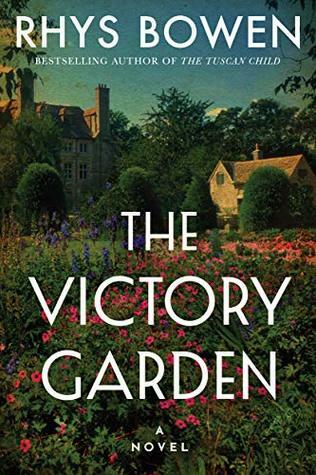 So when I saw The Victory Garden on Netgalley, I knew I had to read. Amazon affiliate links are used on this site. A free book was provided by an honest review. This might be my most anticipated read of 2019 and I was not disappointed. I would have read it in one day had I not had plans on Saturday. The Victory Garden started out a typical war story but comes to be so much more than that by the end. Emily is from an upper-middle-class family whose mother wants her to her to marry a titled gentleman. They have already lost her brother and so her parents have tightened the reigns on her independence. However, it is 1918 and the world is changing. Emily, who was privileged enough to attend school is saddened by the loss of balls and society parties caused by the war, but at the same time, she wants to be useful and make a difference in the war efforts. She also doesn't share her mother's desire for a titled position. As this story is set in England during the final months at WWI, the focus is on the women on the homefront. As I side, it is more than just a typical war story. It is about love and loss, family, changing times, and finding oneself. I'm a huge fan of Downton Abbey and Emily reminded me of Lady Sybil in her desire for independence. And Lady Charlton had the sharp tongue of the Dowager Countess. The same mingling of classes, women volunteering for dangerous and dirty jobs once filled by men, and the general spirit of a nation at war that we saw during season two of Downton Abbey are found between the pages of Bowen's latest novel. I loved seeing what the homefront was like for these women. The characters of The Victory Garden come from all walks of life. After a failed attempt to become a nurse like her best friend, Emily joins the Women's Land Army. These women work the farms in the local area of Devon. A few of the women she works alongside have come from their family farms, have spent time in service or worked in factories, and some have lost their husbands in the war and now must fend for themselves. Emily is probably from the highest societal ranks represented, and they don't understand why she didn't take an office job or another sort of position much more suited to her station. While they are from different backgrounds, all the women see this as an opportunity to improve their lot in life. I loved all the characters. Bowen made them all feel so real, even the marginal characters that less talented authors use to just fill space felt unique in The Victory Garden. Bowen is a fantastic storyteller. She weaves a tale so superbly that the reader falls in love with the characters and are compelled to keep turning the pages to see how life turns out for them. The Victory Garden is a must read for fans of Rhys Bowen and anyone who loves charming coming-of-age stories. Glad it was all you hoped for. You know, I often tend to shy away from historical fiction, but your joy here is contagious and makes me want to read this as well! I'm not sure what made me take a step back from this particular genre- I think I may have put down one too many overly (for me) literary novels about the past, and literary fiction isn't really my thing, so I'm thinking I need to reconsider my stance. Thanks for this great review!